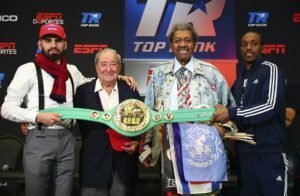 Bob Arum and Don King will renew their old rivalry at the ‘Mecca of Boxing” this Saturday for Ramirez vs Imam world title fight. It may well be the last time you will see Bob Arum and Don King co-promoting a boxing match that will feature Jose Ramirez (21-0, 16 KOs) a top rank promoted fighter taking on Amir Imam (21-1, 18 KOs) one of the few remaining Don King fighters for the vacant WBC super lightweight title at the Hulu Theater at Madison Square Garden. Ramirez vs Imam is an historic bout as it marks the 2,000th world title fight for the WBC in its 55 year history. King and Arum have long been promotional rivals and at one time were considered the most powerful men in boxing during the 1980’s and 1990’s. Over the years they have fought over fighters, over dates, and were only able to work together sometimes when it came to fight that could generate millions of dollars. Together they promoted Chavez vs De La Hoya, De La Hoya vs Trinidad, and their last co-promotion which was Cotto vs Mayorga in 2011 just to name a few. King is now considered semi-retired, but at the age of 86 he still has the energy, is still very talkative, and still has the desire to find that one prize fighter that can take him back to the top, whether that means he will have to go by his old measures to secure that prize fighter that can help him strike gold. King once said the famous line “I came into the ring with the champion and I left with the champion.” Though King wasn’t talking about the same champion he came into the ring with. On more than one occasion has King tried to steal away fighters from Arum, even once whispering into De La Hoya’s ear following his close loss to Trinidad by saying, “If I was your promoter, you’d have won this fight.” If Ramirez defeats Imam this Saturday night it’s highly unlikely that King will be able to pry away Ramirez from Arum. The old rivals reunited on Thursday afternoon in what was a classic final press conference as King and Arum constantly traded verbal jabs at each other and debated politics. King has vowed that his fighter Imam will knockout Ramirez, while Arum has maintained that King is dreaming if he thinks that will happen. Whatever happens this Saturday night, it’s going to be one fun night of boxing as these two legendary promoters will go head to head for what may be the very last time.